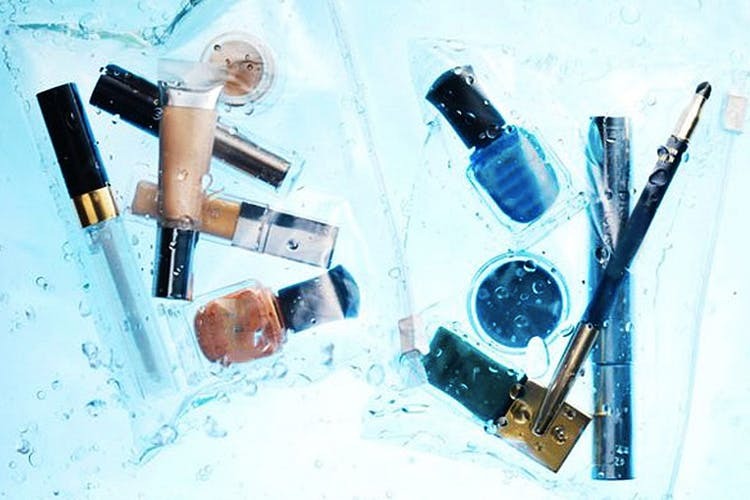 Whether you’re prepping for a hot sunny day by the pool, or simply witnessing a full-blown rainy meltdown, these no-nonsense cosmetics are your go-tos—come rain or shine. If you’ve ever been caught off-guard by the moody monsoon, you’ve definitely witnessed how your once lit Kim K-esque look melts in no time. Be safe (not sorry) by layering on this best-in-the-biz primer. Just a few drops of this non-tinted, neutral formula will magically refine pores and mattify excess oiliness ensuring your face acts as the ideal base. If there was ever a chubby stick that does it all, it’s this one — concealing blemishes, banishing scars, hiding pigmentation and uneven skin in a matter of minutes—we mean everything. Choose from a mix of six shades that blend into Indian skin complexions and offer the best coverage. The crayons are so easy-to-twist and lightweight that they glide over your skin and minimise imperfections. When it’s dull outside, the best way to stay happy — add oodles of color. This palette consists of nine shades, from bright reds to petal-soft pinks—and of course, the crisp corals. Be warned though, with tints that scream 'pick me!' you’ll be spoiled for choice. Plus, the creamy consistency hues are sweat-proof too. Your search for the ultimate feline flick is finally over. Whether you’re risking an exaggerated Winehouse-esque cat-eye, or prefer a subtler nonchalant wing—this is the only pen you’ll need. Complete with a felt-tip that draws on the most precise line to a deeper-than-black shade that’s totally tear and smudge-proof, you’ll never look further. If you’re looking for a change from the all-muted tones around, light up your face with this gel-tip liner. With 16 different hues to mimic your every mood, it boasts of everything from a regal emerald to a dreamy green and a baby blue to sparkling purple. The pigmented color stays put from dawn to dusk, never smearing across your face. Fluttering, long lashes are just a wand away courtesy this nourishing blend of soy and wheat protein that dramatically curls your eyelashes every single time. No clumping, no flaking, and especially no streaking—trust this black beauty to deliver more than an intense dose of drama. Add to that the benefits of acai oil to always have peepers that are so on-point. For a pout that’s transfer-proof, pucker up with the latest fan-fave. Enchanting glimmer particles offer an almost 3-D effect that dry up to a stunning foil-like finish. Plus, unlike most metallic mattes on the market, it’s moisturising formula hugs your lips, leaving them ultra-hydrated too. Available in 10 flattering lipstick shades, this guy adds high definition so you get fuller lips. Now, since you’ll be switching up your cosmetic case for high-intensity formulas, it’s best to keep on hand the most powerful, bi-phased makeup remover. Tackling stubborn mascaras, heavy-duty lipsticks, industrial-intensity eyeliners, and budge-proof foundations, it’s the only dual-ingredient concoction that can get rid of it all. Soak, swipe, rinse, repeat. Extend your make up lifeline as you take on the murky world, with every move you make. Just spritz on and let this savior do the talking. Its non-sticky formula ensures you won’t have any makeup meltdowns, while also hydratng your face (as the blend is infused with moisturizing aloevera). What more could one want from a humble sealant, right? This recommendation was first posted on Nykaa.